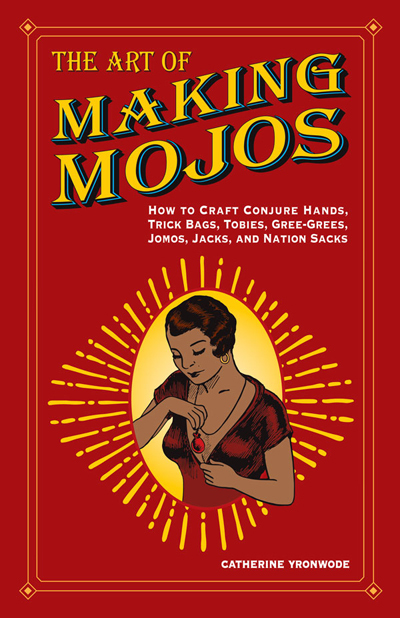 "The Art of Making Mojos: How to Craft Conure Hands, Trick Bags, Tobies, Gree-Grees, Jomos, Jacks, and Nation Sacks." There are more than 100 mojo hand recipes in the book, as well as page after page of general instructions. Within these pages you will find a treasure-trove of accurate, authentic, and easy-to-follow instructions that teach you how to craft and work with Conjure Hands, Trick Bags, Tobies, Gree-Grees, Jomos, Jacks, and Nation Sacks in the hoodoo folk magic tradition. Catherine Yronwode is the co-proprietor of the Lucky Mojo Curio Company, a manufactory for traditional herb-based conjure supplies, and the pastor of Missionary Independent Spiritual Church. Her books on folk magic and divination include "Hoodoo Herb and Root Magic," "Hoodoo in Theory and Practice," "Throwing the Bones," and "Paper In My Shoe." She lives and works on an old farmstead in rural Northern California with her husband, a dog, cats, and chickens. I had a weird flashback today to a dream I dreamt a couple of nights ago and forgot about. I was sitting on my living room sofa, someone (I don't remember their face) sitting next to me (I live alone) and between us, one of my two mojo hands. I remember thinking to myself in my dream "oh no, they can see the hand.. I hope it's not ...." - I have two mojo hands and my newer one (Attraction) I feed daily and really look after, whereas the other one (Lodestone) I feed every few days (each to attract different things), and in the dream I feared it was the hand the hand that I "favour". Of course, no one had seen either hand in real life as far as I know (only time I was close was when my Lodestone one fell out of my bra.. but no one seemed to be around and it's been working well since). It was the first time I dreamt of the hands. I do wonder if it means anything at all. Both of them seem to be really helpful in my life and have been great. I wouldn't stress about it. Dreams can sometimes reflect our fears and anxieties, and not necessarily be a premonition. That said, take it as a message from Spirit that you need to continue safeguarding your mojos from sight. They're working for you, so clearly you're doing something right. Keep it up. No, you would make a new mojo for your new (singular) goal. If you have curios for luck inside the bag that are still in good condition, you can use them in your new bag. I am absolutely devastated. I had two mojo hands I fed daily and looked after. One for a few months and the other only a month. Both have been truly successful for me (one for attracting a specific friend and the other for general luck and success). I went to a show today and I knew we could get searched so I left them at home covered in my clothes. I forgot the cleaner asked if she may come today instead of Tuesday! So I just got home and found them on my dresser. She didn't just see them, she touched and moved them. I am actually heartbroken. I have one Blues Boy mojo hand I have yet to make, tucked away, so I plan to make it now. But will make minor changes to turn it into an Attraction one, specifically for that friend. I have extra Rose Petals tucked away. The only thing I'm missing is Cubeb Berries.. and, unfortunately, a lodestone. Because one was missing from this order so it was sent to me separately and I'd used it in a honey jar. I wondered if it's possible to take just lodestone from one of my dead hands, cleanse it, feed it and repurpose it? Also, what would be the best, most respectful way to dispose of them? I don't have a yard or any outdoor space unfortunately. But if I need to bury I could walk down the road for a park. Before you throw them out and call em dead I would pray over them feed them and do divination to make sure they are dead. If you are sure they are dead then you bury them for their work. For things to draw in your yard, since you dont have a yard bury in a potted plant. When I leave mojos at home I put them in a draw with my personal items or a photo of me. They honestly feel different to me. I'm rather certain they are dead. I mean, they were touched by her too. I never hide them because I live alone and no one ever comes in - except the cleaner - only on Tuesdays. I absolutely had no clue she was coming today. Quite horrified when I got home. My plants are all small and it won't fit in I believe... But I'll try. As for the Lodestone? Or if the mojo is dead there's no point trying to salvage the lodestone from it? Personally, I get rid of any mojo bag of mine that has been touched by someone else. I bury it at a crossroads or graveyard, or dispose of it in running water. I don't believe it is of any further use to me so I dispose of it properly. I will only touch someone else's mojo when I am making one for a client and even then, it is unfinished and uncharged until they put their personal concerns into it, breathe life into it and start working with it. Yes you can re-purpose any curios or durable roots you have in your bag. Cleanse them with whisky before re-using. You would need to use fresh herbs in your new, replacement bag. Strangest thing. I have decided to pray over the hands last night and feed them and I asked them to give me a sign if they're still alive. I specifically asked one for something extremely fortunate to happen (without specifying), and the other for communication today from the friend I'm trying to draw - I believe I did ask for a specific message then (it needs to be mentioned he almost never writes to me first. I tend to start communication). I was at an event today for work / networking reasons which is always a bit awkward. During the show a bucket of fake blood was spilled, hitting my friend and I almost directly. We thought it was hilarious. We spoke to cast and director after and they said it had never hit the audience before. We loved it and opted not to wash it off because it was a conversation starter! People were impressed. So, I suppose many would take that as a bad thing? But for me today it was positive. I got home and got a message from that guy. Unfortunately not a great message (asked to change the date on our next meet) and yet still, it is so rare he makes contact first that I'm a bit shocked. I suppose both could be coincidences but despite mojos being seen, touched, who knows - possibly opened - I feel like I should give them a few more days. Coincidences in hoodoo are signs. Read them and interpret them accordingly. PS your job sounds very fun!! Honestly, if today and yesterday are anything to go by, I believe the Lodestone hand is still working, while the Attraction one isn't. I do pray over them and feed them daily, and will continue to do so a few more days so I'll be sure. But for now, the Lodestone is definitely affecting my life for the better. Great news! Keep praying over them, feed them, even smoke them, sleep with them, pray over them. Ask for signs if they are alive. If one is dead burry it properly and create another one. Thank you to the beautiful gal at Lucky Mojo who did an additional prayer for me as i was leaving. I've talked to her a few times now and i feel extremely connected to her. LOL aniviel...whiskey as a promised reward can make many of us compliant, but that is a topic for another day. Keep working your mojo, and I wish you continued success with it. One of the great things about Lucky Mojo's spell kits is that they come with all of the ingredients you will need to perform the spell, apart from any personal concerns you would need to add. So if you buy a mojo or a kit you don't have to worry about adding other herbs to them. Lucky Mojo does not publicize the exact nature of the recipes used in creating products or kits. Just trust that all ingredients are carefully chosen and prayed over for the conditions they are intended to affect. In the court case kit low john root is the court case root, it is traditional to chew it while in court. Thanks a lot. Yeah I’ll def be chewing on that low John. Is high John the conqueror included in the kit btw? You are posting in a thread about mojo bags. They are not kits. If you still have questions about a specific kit, go to the forum thread about that kit, by name, and ask your question there. We now return you to our regularly scheduled thread about mojo bags. Please accept my apologies if this is not the correct place to post my question, I am very new to the forum although a long time lurker . I have purchased a triple strength Love me mojo bag from here . The instructions for the spell to activate the bag state that I should begin on the New Moon. Due to my living circumstances, this is not possible to do the spell in secret but I have opportunity to start now as I am alone in the house for the next two weeks and will be undisturbed . However , last night was full moon and the moon will be waning from now on . If I start the spell and disregard the new moon instruction, do you think it’ll still be successful? The bag is to draw a certain person to me but I don’t want to repel him in error , he is incredibly resistant as it is . You are in the correct place. Thanks for your diligence. So timing in Conjure is not a hard-fast "rule" that "must" be observed. If a spell says to start at a particular time of day or during a particular moon phase then it just means that the energies are stronger or the "stars are aligned" so-to-speak for that kind of working. It is only a recommendation and will not definitively determine your success with that spell. Thanks for your reply Dr Darensbourg . I know in hoodoo we do the work when we need to but as the instructions to activate the bag are quite clear , I worry not to get it wrong . This will be my last attempt to work on this person so it is very important for me to work . I understand your concern but again it is only a recommendation. As you pointed out we work when necessary in hoodoo and if convenient we work in accordance with timing methods. In your situation I don't see that you have much of a choice but if you want to wait until the moon phase that is completely your prerogative. My only objective here is to ease your conscious by assuring you that your work will not be unsuccessful or negatively impacted because of failure to perform it during a different moon phase. ACK! Emergency question! I need a mojo asap for a new job I'm starting next week, heavy tech work. While I didn't lie on my resume, I might have oversold myself. King Solomon? Crown of Success? Steady Work? I'm probably having some imposter syndrome here. Are you asking about oils to dress your mojo with? If so, a mix of your choices would work well. Anoint yourself with Crown of Success daily as you settle into your new job. Don't stress, everyone sells themselves in an interview. Work your mojo, have faith in yourself and you will do fine. I wish you the best of luck in your new job! Please keep us posted. So I was reading the instructions for my new triple strength mojo bag. It’s a 9 day spell and it says to leave the mojo bag on my altar for 9 days next to the candle. The issue is that I tend to do my work in private and I do not have a private altar that will not be disturbed right now. I do my work on my fireplace mantel and then I put everything away in a box when I am done. I have to young children who can climb and touch and a very nosy husband. Is there a way that if I perform the spell at night alone that I can just wear my mojo bag as well for the 9 days? Or can I put the candle and the mojo bag and intention paper together in my lock box with my other magical items and just take it out at night when I perform my spell? Something keeps telling me to just start wearing it on me while doing the work but everything I’ve read on here says leave it until it’s ready. This is a very good question. The amazing thing about traditional hoodoo is that it is adaptable to the individual needs of the practitioner. You can always modify spells to fit your specific needs. Consodering the conditions you describe, my advice to you would be one of the things you suggested. Burn them at night or whenever your preferred time is for a dedicated amount of time... 90min/night for 9 nights for example. Keep in mind that the instructions that come along with the products or merely recommendations to get the most out of your product. This does not mean that making modifications will be detrimental to the work or ineffective. That said, don't ever ignore your intuition. I wouldn't just stick it in and start walking around with it but feel free to do an abbreved version of the recommendation to at least set it to working if you must. Some of the Lucky Mojo spell kits have you do a working for several days, at the end of the work you take the petition, loose ingredients and concerns add them to a bag and make a mojo. Example the Reconciliation kit has you burn a candle for 7 days, after the 7 days you collect the items place them in a bag and wear it, this would be an example of working a spell for several days then a mojo in the end. Ah that sounds great. Thank you. Next time I'll get a spell kit. I purchased a mojo hand and, before I can start carrying it, I have to perform a ritual to prepare it / bring it to life. The instructions given specially call for disposal of the photo and pins in running water and to not turn back. But for one, I hate the idea of "littering" (I hate referring to it as that but photographs don't really...disintegrate (again, I feel like this is the wrong wording) easy and I don't want them to just drift around). Two, we've had a lot of flooding here in Kentucky and, last time I checked, a lot of the local waterway access and such have been blocked for safety reasons. Basically, I'm hoping there is an alternative. I know other methods are mentioned in the "disposal of" page of the site but I'm wondering, since I was given specific details, if those are still okay to use. I am hoping this makes sense! Mad as a box of frogs. It is always advisable to follow the instructions as written to ensure best results. If you can't access a river from the normal access points, you could always use a bridge. Just an idea. I figured that would be the answer. A bridge is a good idea, unless I can think of an access point that is safe and accessable. I'm seriously thinking of buying a Mojo Hand. I'd like to know which is the most powerful for money and success? I want the most powerful Mojo Hand. I know the Jack Ball dominates all(I plan to buy one after the Mojo hand brings me the money I need). Is there a MJH just as powerful or at least right under the power of the JB? You can order a triple strength hand. For drawing in money and success, I would go with the Triple Strength Lucky Red Clover mojo hand. Thanks so much! Will do ASAP. This will open many doors for me. One of the most important is attending Ms. Cat's classes and climbing out of debt. Tonight was the last night (of nine) to feed my mojo hand and instead of saying "(Name) be mine. ", I said ""(Name) love me. ", as instructed for the first eight days. But I did say it as I was finishing up. Did I screw it up? Do I need to start all over? You should be fine since you corrected yourself. Moving forward, be extra mindful of following instructions as stated, as a lack of focus can derail your work. However, I think you'll be OK. Thank you once again, Miss Athena! I finally got a pendulum (teardrop shaped). I recall I could use it to check my Hand is "Alive"? Are there other questions I could ask it? I'm making a second Mojo. My plan was to do it this Wednesday because it's for Attraction (mainly Communication from a great friend). It's also a Full Moon that night. Is there a specific time that's best to make it? I also light a honey jar for the same person. A few times I woke for sunrise especially to do so but as a night person - waking up at that time leaves me with extremely low energy and much harder to get my focus in order. So often (like today) I light my candles much later or after midnight the night before.. What would be the best time for it? Some people work with the hours of the days, the planets, the hands of the clock, the days of the week. Some do the work when they need to and do not fuss over that. I find aligning work with those correspondences helps increase the natural push and work. For example, you specifically want to make a hand to effect communication with a person, but the planet Mercury is retrograde right now and it is often highly suggested to not do that during this time, to wait till it goes direct again. Day of the week would be Wednesday ruled by mercury, during the morning hours as the sun is rising to bring the sun draw this to you, when the hours of the clock are moving upward at the same time to draw to you. Thank you JayDee. I'll try to do sunrise when I'm able to wake up that early. I do follow the days of the week / hands of clock rules anyway though (I tend to start at a specific time after 6:30pm if I can't wake up for sunrise). I thought this Wednesday would be great because it's Wednesday but also because it's a Full Moon and I do follow the Lunar Calendar for my own emotions. However, I forgot Mercury is in Retrograde (no wonder it's been such a hard time lately...). I'm still going to light yellow candles + Mercury oil on my honey jar but I'll save the new Mojo for the April Full Moon then. I see it comes up on Friday the 19th, post-Retrograde. Thank you! I read that some mojo hand should remain unseen, untouched, etc. I ordered the Triple Strength Love Me mojo hand. It just says to keep it on my person but nothing else. Firstly, should I keep it hidden? If so, what is I put it in another cloth bag and wore it around my neck? It's TECHNICALLY out of sight but...not. A bag in another bag. What do you guys think? Yes a mojo should always be kept hidden from others eyes and touch. Women often wear it in their bra or undergarments. Men in a pocket or attached to undergarments. Wearing it around your neck would still be seen. I would not wear it in that fashion. Actually, JayDee gave you a great MEN'S answer -- but we WOMEN often DO wear a mojo on a string around the neck -- and the string must be long enough that the mojo can be tucked into your bra (which is, of course, also a form of "undergarments")! I actually have that book! I did also read that it could be worn around the neck but I didn't think about it going under the clothes like that. Which is funny because it IS on the front cover! Thank you so much, now I don't have to worry about it falling out! While waiting on my Mojo bag to arrive... are there any pointers on things I should be doing? I don't understand your question - "doing" with regard to what? Depending on your goal, you may be doing other work so continue that. Otherwise, I don't know how to answer such a vague question. Was there something in particular that you have in mind? Being a Mercury Retrograde I haven't been doing anything, but reading. I was wondering should I prepare mentally? Should I make some kind of list of manifestation? Should I start taking hossip baths? This will be my 1st Mojo hand. I'm excited and I really don't know what to expect. I'm praying for some serious positive life changing prosperity on all levels. I'm so nervous and excited! No worries, LittleWitch2020. Mercury retrograde is affecting everyone, it seems. You don't have to do anything to prepare, other than making sure you are focused on your goal. No need to take a hyssop bath since you aren't cursing anyone or doing any kind of negative spell that requires cleansing yourself afterward. Lol lol thank you, so much. You know I can be a little extra at times. I've been reading others post on the matter. I think I'm gonna have to add a lock of my hair for this mojo hand. Now, I gotta decide which part of my head won't be noticable. Thank you, and all the Lucky Mojo crew! I just know this mojo hand is gonna change my life in beautiful ways. You don't have to cut a lock of your hair for your mojo bag. Just pull out one or two individual strands. That will be enough. We shed more than that per day, and it's not noticeable. No need to go beyond that. Thanks for letting me know ahead of time. Whew, what a relief! Now, I'm patiently waiting on my mojo bag. I feel like a kid... waiting on Xmas. Greetings, unsure where this first post belongs, this thread seems most appropriate. I'm interested in possibly purchasing a mojo hand from Lucky Mojo, but it is not listed in the inventory. I emailed the shop at the order email as the info email wouldn't accept my message, and Nikki at the shop told me posting here would be better. I've since read the entire thread here and been edified. 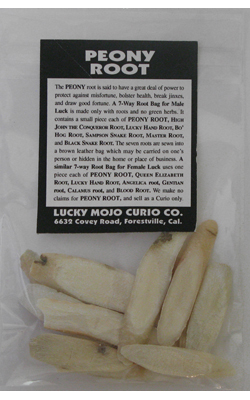 The hand I'm interested in is the one mentioned in Hoodoo Herb and Root Magic under the entry for Peony as A Seven-Way Root Bag For Luck, specifically the one for men. The entry is short, and I wanted to know if there was more information available about it, whether the shop would make it for me if it sounds like what I'm looking for, and what it would cost if available. Money's tight just now, likely have to save up. Thank you for your time and consideration. Hello, and welcome to the forum. We do not make every mojo in the world, and although we do make a good 80 or so doifferent types, we are here to empower YOU to make your own mojo. It will save you money and it will teach you how to be the master of your own fate. You can order the ingredients from us, and a bag too -- and then go for it.